Lavez vos soucis dans ce studio, condo Direct OCEAN FRONT. Nous sommes situés dans le Daytona Beach Club Resort. Cet appareil est parfait pour les célibataires, les couples ou les petites familles. Profitez de votre café du matin tout en regardant le soleil se lever sur l'océan depuis votre balcon. Prenez une promenade facile sur la plage pour le Main Street Pier et Boardwalk ou visitez l'un des nombreux magasins et restaurants spécialisés dans Ocean Walk. Aucun détail n'a été négligé dans cette unité entièrement meublé qui peut accueillir jusqu'à quatre. La chambre contient un lit queen surdimensionné avec des draps de luxe et il ya un canapé-lit dans le salon. Vous trouverez une télévision de 32 pouces et un DVD. La cuisine est bien équipée avec un réfrigérateur, une cuisinière et micro-ondes. Vaisselle, ustensiles de cuisine, marmites, casseroles, et de l'argenterie sont fournis. La salle de bain est étincelant de propreté avec une ample provision de serviettes. Ceci est une unité non-fumeur. Bien que nous aimons les animaux, le complexe ne leur permet pas. La station offre une belle piscine et bains de soleil, barbecue, ascenseurs, parking couvert ou découvert. Nous sommes fiers de la propreté et l'attention de la copropriété au détail. Nous espérons que vous apprécierez autant que nous faisons! Nous avons aussi 2 autres condos à Daytona à louer. Our room was great for a quick, last minute get away. Jennifer was amazing and very friendly to work with. Would definitely go back. You have been the sweetest guest all year! Thank you so much.! 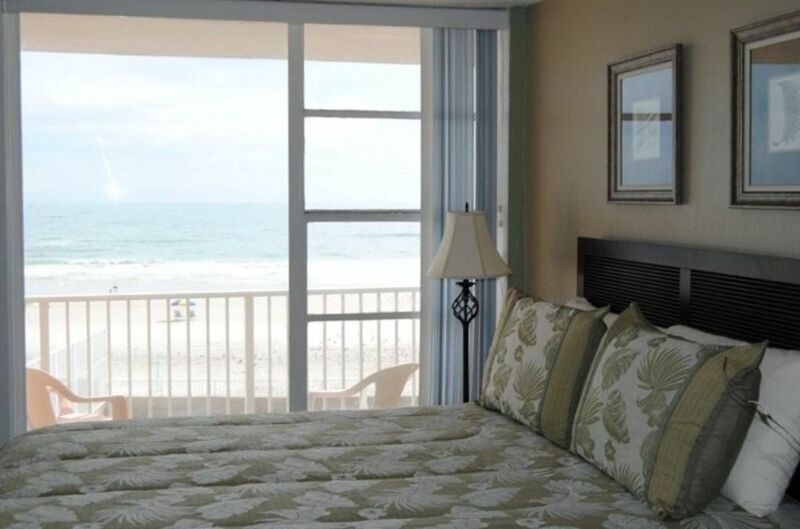 I rented the direct oceanfront room in Daytona Beach but about a few days before going on our trip I received a phone call stating that the pipes in the room busted and was given a none oceanfront room but for the same price due to the none oceanfront room had a full kitchen. I still feel like due to the circumstances we should have received a discount. We were still given the option to walk over to the other room to use the balcony which was nice of the host. In all Daytona was beautiful. Did have a problem with sand fleas from the beach though during our trip. Woke up with little bites all over us. Those went away about a week after our stay. Next time will use every preventative measure there is to keep these annoying pests away. The room we used was a little outdated but still comfortable. Would definitely rent again but only the direct oceanfront room. I originally booked the ocean view, but the night before our trip the owner called me to let me know something happened with the plumbing and she couldn't rent out the one I had booked. But she instead gave me a bigger condo with a slight view (condo is on the beach anyway, so) and an extra night for free. The building is old, but inside the condo itself was lovely. It was super clean, very quaint, had everything we could want, and was very comfortable. You can walk onto the beach within seconds. There are some interesting characters who live around there, but all were extremely nice. The owner of the condo was extremely responsive, very helpful and did what she could to make the situation right, even though it was out of her control. All of her instructions were very clear and concise, so there was no misunderstanding the rules! Thank you for a lovely stay!!! The location of this condo was perfect. It was very clean when we arrived. We unfortunately couldn’t use the balcony at all because the pigeons didn’t seem to be bothered by any diversions and had defacated all over the porch. The bathroom towels all smelled like cigarette smoke - so we had to go out and buy more. The building itself was definitely older, what’s to be expected from something that’s been taking an ocean beating for quite some time, but overall we enjoyed the area as a whole! The room was exactly what it said! My kids loved the pool! We had a nice stay, and I would go back. Thank you so much for the great review. Please do contact me again for your next trip. Jennifer with the Funcondos ! Clean but not high quality. Great location and view though. Some of the bedding was missing and they brought it by and apologized the day before we left. Decorated well, but stains on things, rust on things, just looked old. I apologize for the bedspread not being there, my house keeper did not know you were coming in and had removed it to have it cleaned.. I wish you would have contacted me when you arrived. I could have taken care of the problem, an avoided a less than good review.. I hope it didn't effect your vacation fun. I will find out what is stained or rusted and have it replaced. Nous avons également un autre condo dans ce bâtiment et deux dans un autre complexe à seulement quelques pâtés de façon.